We all have those moments when it feels like we have more to do than there is any feasible way of getting it all done. 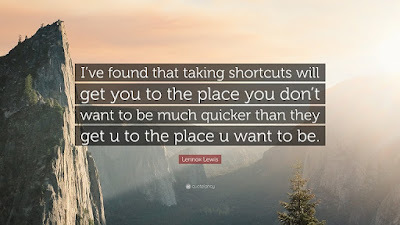 It is easy in those moments to look for shortcuts. To try and find the quickest way of getting done just enough that you can cross it off your list. That is the easy way, but it doesn't get you very far. The other way to look at it - how can you deliver your best work given the obstacles in front of you? Can you spare 10 minutes to make it just a little bit better then the minimum? How much time will it take to deliver something you can be proud of? A key to being successful is finding the right mix of getting it done and getting it done well. Proofreading your report one time, yes, please take the time to do it at least once. But you probably don't need to proof it 20 times, somewhere along the way your time proofreading becomes wasted. In a recent conversation we were discussing things our group could do to get better. A comment was made about how mistakes were made yes, but they were working hard on the problem. It got me thinking about how often we are working hard, but yet aren't being effective. The analogy that popped into my head as I reflected on this concept was as follows. Imagine if you have to put a post in your yard, you know you have to dig a hole. You dig that hole and you work hard at it. When you are done you have a hole and worked up quite a sweat doing it. You are probably sore and maybe even have a few blisters. Nobody would deny that you didn't work hard. But if the hole is in the wrong spot in your yard that hard work really meant nothing. Worse, if you started digging and didn't call the utility companies you could have dug a hole and cut a wire causing a very expensive and perhaps even deadly problem. 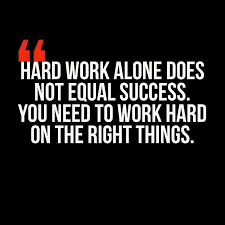 Working hard is important, but make sure we are working hard at the right things. I've been working my way through Tribe of Mentors: Short Life Advice from the Best in the World by Tim Ferris. It is a nice book to read daily, reading one section at a time. If you like inspirational quotes, ideas, book recommendations it is a great resource (you can buy it here). 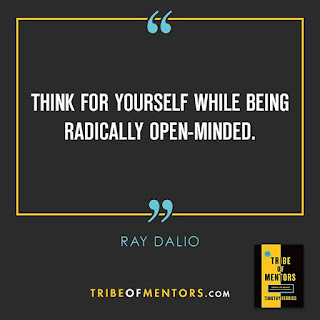 One of the quotes I read that really struck a chord with me was by Ray Dalio, "Think for yourself while being radically open-minded." I love this idea. We tell people to think for themselves, come up with your own ideas, don't wait for someone to tell you what to do. But we all know those people that go too far with this concept, they think their idea is great and they argue against everyone. I was at the grocery store recently and I had the opportunity to help a lady who had her hands full put her cart away, it literally took less than ten seconds of my time. I walked away thinking about how good that smile and thank you felt. I realized something about myself that I hadn't ever really given much thought to, how much I like being kind to others. 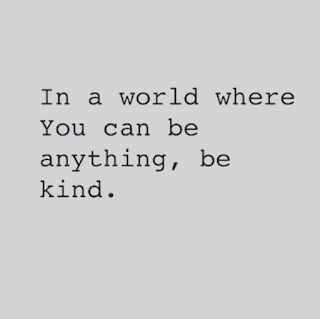 I don't know how much of an impact it really has on a persons life, but I hope that in a world with so much negativity that I can make a small positive impact. Past, Present and Future - The Need For Balance. As we journey through life we can look forward, look backwards or look around at where we are. You need to do all three, and one is not more important than the other. You need to look back. It is valuable to see how far you've come. If you only focus on the future and where you want to go you can get discouraged, forgetting that even though you aren't where you want to be you are still farther than where you were. You need to look at where you are. We need to be present, enjoying the moments and relationships of each day. Being ready to seize the opportunities of the moment that present themselves. 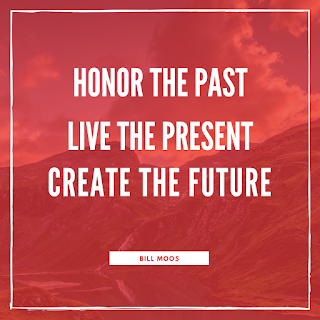 If we are only focusing on the future or the past we miss the life that is right in front of us. 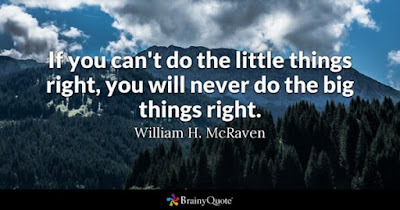 How Much Should I Think About Little Things? It has been a crazy period at work lately, I've found that little things have been tripping up my team. Little things in communication. Little things in our testing process. Little things in the requirements gathering. You name the phase of software development it hasn't been kind to us lately. It got me thinking about the little things and how important they are. Or are they not important? A quick Google search and it doesn't really surprise me why we get confused with the conflicting messages before us on how we should view the little things. What Parts Of Our Life Keep Us Captive? I love how a single quote will resonate with me and connect with multiple areas of my life. 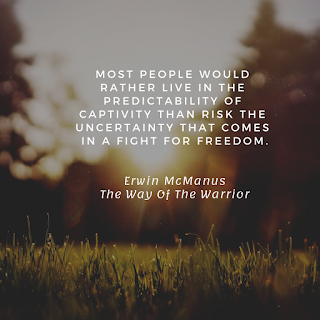 I haven't read any books by Erwin McManus but words like this are enticing. What are the things that keep us captive and what is our freedom? For some it might be staying in a job we don't like because it pays the bills rather than taking a risk on a career change or starting your own business. It could picking your classes and career path based on what your parents or others of influence tell you. Some could be following the crowd rather than declaring who they are and accepting that not everyone may like them but that is okay. We get comfortable and complacent, slowing letting the days go by feeling unexcited and uninspired. We do our jobs even though there are things we know could be better, afraid that challenging the status quo could impact our position. Scared to speak up, following the processes given to us and responding, "That is how I was told to do it." Everyone talks about the million dollar idea. That spark of ingenuity that creates something incredible. A work of art that others talk about. The tweet that goes viral. The best seller in the sea of infinite choices. 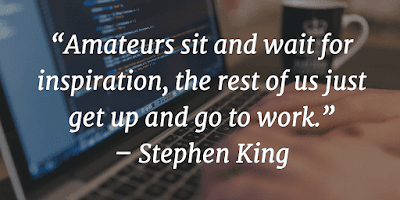 Most of us sit around and wait for inspiration to strike, to have an idea hit us that nobody has thought of and have the ability to turn it into something. Unfortunately that is why so many people in the world spend their days unfulfilled, hoping for a spark. We have a lot of people that are stuck in a routine of doing the same thing, day after day, because someone said that is the way it is done.